Lonely Planet's Top Accommodation Pick of Bicheno and surrounds. Ultimate Beachfront. Private and Secluded. Sensational Views. Clay tennis court. This secluded retreat is set on 8 acres (3 hectares) of tall pine and native trees in park like surrounds, with a sunny northerly aspect. 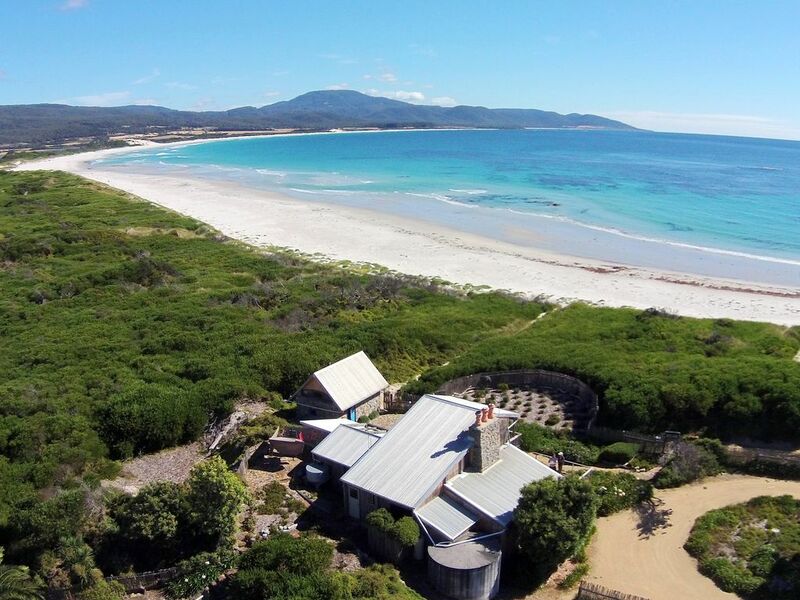 A unique Tassie beachfront experience, relax or walk for miles on the gleaming white beaches out the front to the north and south towards Bicheno. Aurora is loved by all. Perfect for two or up to four people. The two level cottage features stone and timber construction, a large timber deck with stonewall surrounds. Interior layout includes separate kitchen, split level lounge with woodheater, heaps of glass and two sunrooms, one with double bed, off the lounge/dining area. A few steps lead up to the bathroom with plenty of light and plants. The main upstairs bedroom with Queen size bed, has a balcony with panoramic beach, ocean and coastal views. There is an external laundry and WC with second shower off the main veranda. We are not able to accommodate babies or children under 12 years of age. Aurora is a "Land for Wildlife" property. We have a "No domestic animals" policy. Check-in time is 2 pm (14:00) and check-out time is 10 am (10:00). Travel time: Launceston Airport 2 hrs, Hobart Airport 2.5 hrs, Devonport Ferry 3 hrs. Step out on to the beaches, walk for miles, explore foreshore reserves, marvel at the natural world and the black swans on the nearby lagoon. - 1st floor Bedroom: Queen bed, with balcony. - Sunroom alcove, off lounge room: Double bed. Full kitchen facilities, gas BBQ, TVs-VCR, DVD, CD/MP3 HiFi Stereo, Wood heater, Library, Hair dryer, Washing machine & dryer. We had the most amazing time in Tassie, and in particular our stay at the Aurora Cottage. It was perfect in every sense of the word. From the spacious layout to the breath-taking views and access to the secluded beach, we thoroughly enjoyed our stay. The kitchen was a joy to cook in and the music system and selection of books and DVD brilliant. Best of all was the sightings of whales breaching in the bay which we could see from our room lying in bed! Oh and the moonlight too... Thank you Michelle for making your place available to us. Aurora is the most wonderful place. The cottage is beautiful, spotlessly clean and full of charm and atmosphere. We have stayed at Aurora several times and it never disappoints. A few days here is the equivalent to several weeks holiday. It is so relaxing. We highly recommend this place. It's heaven. Exceeded our expectations in all respects. Nice attention to details. Fantastic position. Wonderful destination. This is a unique place. We loved the quiet, the view, the beach side location, the charming cottage with its up-stairs Oecean-view bedroom, the wood fire. What a magic little hideaway. Seven nights away from the hustle and bustle of life, it was sad to leave. We had a fantastic time and will certainly be return visitors.